This book has been on my list to review since I started doing book reviews. The Quilt Show is about to do a show that features sashiko, so now seems like the perfect time! 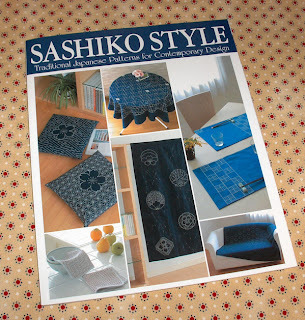 Sashiko Style (Japan Publications Trading Co. & Joie, Inc., 2007) was originally published in Japanese, and this edition was translated into English by Yoko Ishiguro. As you can see on the cover, it has instructions for 18 traditional and elegant projects. 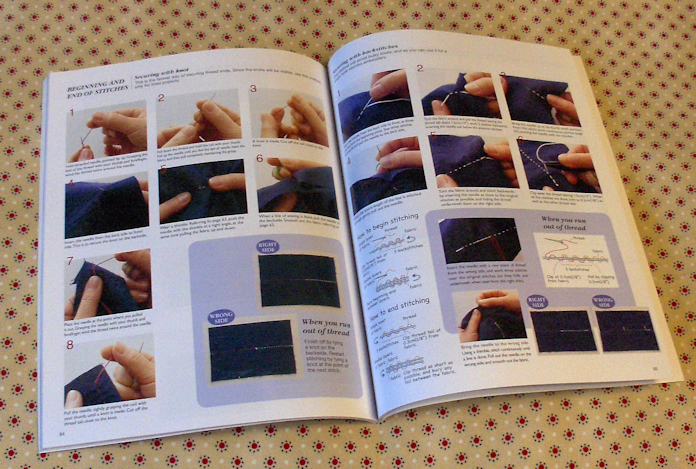 By far its main strength, though, are the detailed and thorough instructions for how to actually do sashiko. I bought Paradise Stitched by Sylvia Pippen at the same time as this one, and while she has some really beautiful designs, the instructions are very thin. So I would recommend this book no matter whose designs you end up trying. I was very interested to learn that sashiko originated as a counted thread technique, that was done to give additional strength to loosely woven cloth. Now it is more of a decorative technique, and you do not have to count, although this book does give instructions for counting if you want to. If you have read any of the Japanese quilting magazines, you know how thorough they are with diagrams and photos of the instructions. This book has the added bonus of being translated into English! Even with all this, it is not a huge book. There is no fluff. It has everything you need, and nothing you don't. 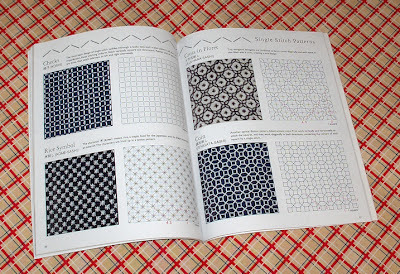 It also includes a pull-out pattern at the back for all the projects in the book. How exactly is she holding the needle? The same way you do sashiko! It is thoroughly explained in this book. Although I haven't tried it yet, I will soon. I already know the project I want to do. So once again, this is another book I highly recommend!